Even on short day hikes, you need to consider how much food you’re carrying. 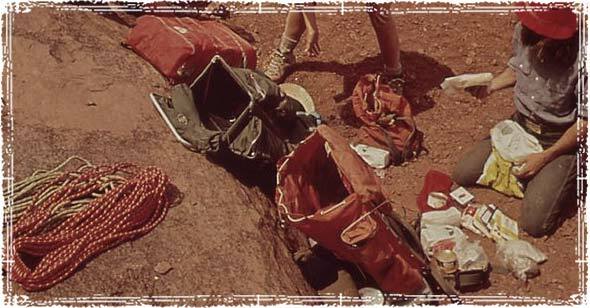 Remember, even on short hikes things can go bad, and not packing food can make a bad situation even worse. Getting ready for the Trail: What Backpacking Food Should you carry? Hikers can burn thousands of calories per day, making food one of the most important gear considerations you can make prior to your hike. Not only is a hungry hiker a cranky hiker, but not having adequate food supplies can seriously put your hike in jeopardy. When determining what types of food to carry in your pack, consider the energy you will receive from those foods versus the weight that you will be carrying. Pick high-calorie, high-protein foods that will help provide energy while at the same time cut the overall weight of your pack. To further cut down on pack weight, remove the food from the original containers and carry serving-sized amounts in sealable storage baggies. Carry lots of quick high-calorie snacks, including things you can store in your pockets and snack on while you’re walking. Avoid canned foods or foods high in water weight. How much food should you carry? If you’re out on a short day hike, then you can pretty much carry whatever you want—even fresh vegetables and fruits. But if you’re out on a multi-day hike you need to be a little bit more selective when choosing food for the trip. Typically you should plan on carrying somewhere around 1.5 to 2.5 pounds of food for every day out on the trail (this equates to 2,500 to 4,500 calories); on longer hikes, this means you may have to make arrangements to pick up food along the route. In cold weather, or areas where the hiking is more strenuous, you may have to increase the amount of food you carry to make up for the increase in calorie being burned. If you are out in an area where resupply may take a couple of days, you need to account for bad weather or injuries that could cause you to stay at basecamp for longer than expected. Plan ahead, and always carry a little bit more food than you expect to need. While 3,500 calories a day is a good baseline calorie goal for most backpacking adventures, the actual number really depends on your weight and your metabolism. According to the Mayo Clinic, a 160-pound person burns around 511 calories per hour; a 200-pound person burns 637 calories per hour. For eight hours of continuous hiking, that would be 4,088 to 5,096 calories, depending on weight. So if you don’t want to lose a ton of weight out on the trail, you should be consuming an equal amount of calories. Plan for 7 meals per day: Breakfast, lunch, dinner, and 4 good size snacks spaced out between the major meals. This schedule will keep your energy high and your body functioning at peak performance throughout the day. Make sure your breakfast meal is large and filled with calories. It’s never a good idea to start the day at a deficit. Make sure you try all trail foods before you set out on your hike. It’s never a good idea to introduce new foods while you’re out on the trail; not only can they make you sick, but do you really want to be stuck with a bag of food you find disgusting to eat? Freeze dried foods are the lightest options you’ll find. Just remember to test them first, because some brands literally taste worse than dog food!